The Admiral 32 XL Cylindrical Rider Scrubber was designed with ease of use in mind. Its compact and maneuverable design allows for you to fit into tighter spaces featuring front wheel drive with the ability to turn 360 degrees. 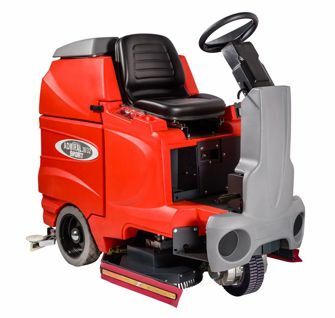 Tilt steering and dual side entry create easier access for the operator and a LED battery indicator helps indicate when the scrubber needs to be charged. Weight with batteries: 1242 lbs.